KOREAN car maker Kia has revealed its 2017 Cerato, bringing with it new interior and exterior styling, improved comfort and technology, and an enhanced local ride and handling package. 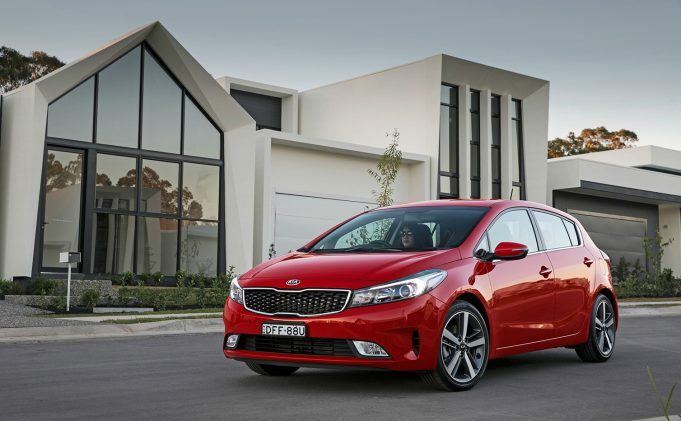 The new Cerato (one of Kia’s most successful models) will be available in Australia in two body styles – a four-door sedan and five-door hatch, and four grades – S, S Premium, Si and SLi. The Cerato range will feature a single 2.0-litre MPI engine from the proven NU family coupled to a six-speed manual in the S grade models and a six-speed automatic across all four grades. Standard equipment levels across the grades are typical of Kia’s philosophy of no compromise on safety and value-added inclusions for comfort and convenience. All models get standard six airbags, anti-lock brakes (ABS) with Electronic Brakeforce Distribution (EBD) and Brake Assist (BA), Electronic Stability Control (ESC) with Traction Control System (TCS), Hill start Assist Control (HAC), and Kia’s Vehicle Stability Management (VSM) system. The Si adds Blind Spot Detection (BSD) with Lane Change Assist (LCA) and Rear Cross Traffic Alert (RCTA) while SLi goes a step further with Lane Departure Warning (LDWS) and Forward Collision Warning (FCW) systems. Standard fare in the S includes 16-inch steel wheels with a full size spare, power windows, projector headlights, 3.5-inch TFT LCD instrument cluster, cruise control, front and rear parking sensors, keyless entry, adjustable headrests, 60:40 split fold rear seats; Bluetooth phone and streaming and FM/AM radio with CD and MP3 audio. The head unit can be upgraded to include a 7-inch touch screen audio visual unit with reversing camera, Android Auto connection, dusk sensing headlights in a $500 option pack. The S Premium adds 16-inch alloys with full size alloy spare, dusk sensing headlights, 7-inch LCD touch screen with satellite navigation and rear view camera, along with additional soft-touch interior surfaces. Moving to the Si adds leather trim seats, rear air vents, auto up and down front windows, smart key with push button start, electric folding mirrors, illuminated vanity mirrors, chrome accent on exterior door handles and window surrounds, aeroblade wipers, Blind Spot Detection with Lane Change Assist and Rear Cross Traffic Alert. At the top of the range the SLi features 17-inch alloy wheels with full size alloy spare, alloy sport pedals, paddle shifters, dual-zone climate control, LED DRLs, eight-way power driver’s seat adjustment, heated and ventilated driver’s seat and heated passenger seat, sunroof, HID headlights, Lane Departure Warning and Forward Collision Warning. All models fitted with the 7-inch audio visual and satellite navigation screen are hardware compatible with Android Auto and Apple Carplay and can be software flashed when licensing agreements are in place. With drive-away pricing from launch the S manual and auto will be $19,990 with an offer of free automatic. With an optional audio visual unit – which brings rear view camera, Android Auto and dusk sensing headlights – the S will hit the road at $20,490. The S Premium is priced from $24,990 drive away with automatic, Si is $28,990 drive away and the range-topping SLi is drive away at $32,490. Kia will maintain its current industry-leading seven year warranty.